To make the most of your Hands 2 Grow production takes planning. The guidelines below help make the planning simple and help us all avoid surprises. Our puppet stage covers an area about 15 feet long and 8 feet deep. Our back stage area for props, sound equipment, costuming, etc. covers another 16 by 5 feet. (See the diagram below.) Height-wise we need at least 8 feet to allow for props and scenery changes. School gyms, fellowship halls, or open church sanctuaries usually work best. It is also best -- if at all possible -- to have the puppet stage on the floor or ground level. H2G supplies its own sound equipment -- speakers, sound board, mikes. Access to standard electrical outlets is the only requirement. There are no special lighting requirements. 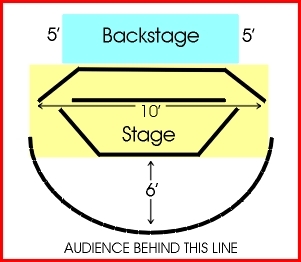 However, it is important not to locate the stage area with backlighting or windows behind it. For a full performance, the normal set-up time is about one hour. This includes time to set up staging, unpack puppets, props, and equipment, test sound system, and troubleshoot any last minutes arrangements. Tear-down time is approximately a half-hour. Outdoor performances can only be held weather permitting - high wind or rain is a no-no for puppets. Because of our financial investment in both electrical equipment and puppets, we prefer to perform under a tent or in a pavilion. Electrical access is important because of the necessity of sound equipment. While every effort will be made to honor our commitment to perform, the final decision on whether to perform or not -- in the outdoor setting -- lies with Hands 2 Grow personnel. Click here to open a copy of the Hands 2 Grow contract for review and printing.